Many a times we are held back from achieving our dreams because we permit our fears to overcome us. We stew in the hell our minds fabricate and sabotage our own ambitions. All Those Pipe Dreams is a reminder that surmounting the perceived obstacles in our path can be achieved by confronting our fears. The play opens with typical banter between husband and wife, with Caitu Soares playfully teasing his wife about her obsession with make-up and ‘high fashion’, while Veena harangues him to get the pipes fixed so that water will flow into the sink again. The scene seems innocuous enough to belie the prospect of anything untoward occurring or having occurred. We learn that Caitu has purchased this huge mansion in the hope of starting a restaurant but does not seem to have made a go of his dreams as yet. Sonali is Caitu and Veena’s daughter, we learn, who has not visited home in a long time and is designing furniture in Chennai. Both parents yearn for their absent child. Meanwhile Caitu sets off in search of the wretched pipes that are blocked and which are presently the source of his tension. He goes through a room and finds that it has a hitherto unknown passageway and a room at the end that eventually leads him to archaeological findings. He calls his wife to share and view his discovery but fashion diva Veena declines. Caitu decides it would be best to send for Sona (Sonali) who would gladly help her father in exploring his new find. While Caitu gets busy with his excavations, Veena lets us into her world of fashion and neuroses. Plagued with nightmares and headaches, she seeks solace from doctor to priest, but none can help her. She keeps complaining that Sonali does not come home and worries about the gossipy neighbours. When Caitu informs Veena that Sonali is coming home to help him and to recover from the break-up of her relationship, Veena remains dumbfounded. The mother who longed for her daughter to return appears almost perturbed by the prospect of having her back. Sona makes her entry and the audience becomes privy to the animosity she displays towards her mother. Veena fusses over Sona when she arrives and Sona makes her disdain apparent. With her father, Sona rejoices at the discovery of a number of different eras of history waiting to tell a story. As Sona and Caitu are unearthing the past, Veena picks up Sona’s phone and receives a call from Nitish, Sona’s supposedly estranged boyfriend. Nitish explains to Veena that the situation between the two of them is not as bad as Sona is making it out to be, and he advises Veena to give Sona her space. Neighbours begin talking of illicit activity at the Soares’ when they witness Sona and Caitu making trips to unload elsewhere the debris they have dug up. This scares Veena, who is afraid they may have to grapple with the police. Then Sona goes on her own into the passageway and, wandering in a reverie, falls and sprains her leg. Veena kicks up a huge fuss about the incident and Caitu finally finds the pipes he has been searching for. Nitish appears at the same time and a hidden secret is unravelled: the reason for Veena’s nightmares and headaches, Sona’s reluctance to return home and her aloofness from her mother, and Veena’s smothering of Sona with unwarranted concern, comes to light. A tragedy…the loss of Sona’s five year old brother to an accident. Nitish is informed that Tony was rushing off to school one morning and Sona, who was 19 at the time, was in charge as her mother had gone to join her husband, who was working in South Africa. Sona had always spoken of Tony with Nitish as a lively and energetic, football loving kid. All pent up anger and sorrow is released and Veena lashes out at Sona, blaming her for Tony’s death. This suppressed anger is what kept Sona away, since she suspected her mother blamed her all along. It was also guilt that curtailed Sona from pursuing her dream of becoming an artist in place of her designing job. Nitish consoles Sona and she explains that finding the passageway with walls of historic significance mysteriously enveloped her and allowed her to break free of her shackles of guilt; especially after the dream she had there with Tony assuring her it had been his time and there was nothing she could have done about it. She shows Nitish the painting she is working on and Nitish acknowledges the need to face your demons and follow your dreams. 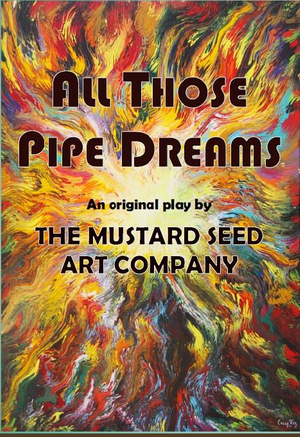 The title, All Those Pipe Dreams, is a play on words as Sona resolves to devote herself to painting; Caitu becomes determined to start his restaurant and Veena finally realises her true feelings which she was choking on, much like the blocked sink for which Caitu finds the rusty pipes. They leave the past in the shadows. The journey through the passageway and different dimensions of history gives one the sense of the unveiling of the family’s own past to end with the discovery of something beautiful that saves them all in the end. As always, a well-written play and, in the usual Isabel Vas style, layered with meaning. 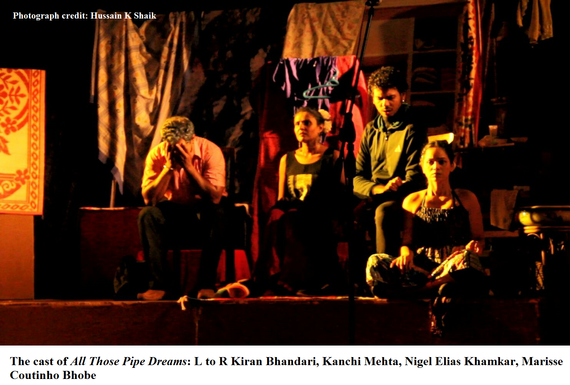 Good performances by Marisse Coutinho Bhobe as Sona, Kiran Bhandari as Caitu, and Nigel Elias Khamkar as Nitish. Kanchi Mehta stands out with her excellent comic timing, mimicking her interfering neighbours, and Kiran partners her well. The play had two songs written by Mario Coelho, and music composition by Schubert Cota. The set was designed by Dean D’Cruz. There was a refreshing inclusion of choreography in the play by Israiel Sarvishta, which was interesting. It is pertinent to note that the painting From Darkness to Light displayed in the drama as Sona’s work is the artwork of artist Clarice Vaz, and is said to have been the inspiration for the play.